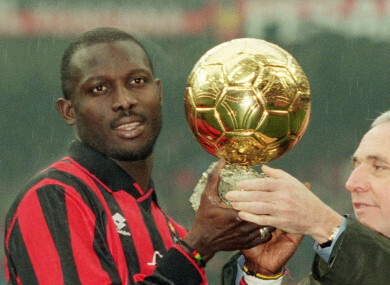 George Weah presented with the Ballon d'Or in 1995. FORMER AC MILAN, Paris Saint-Germain and Monaco star George Weah has claimed victory in Liberia’s presidential race. Weah, a league winner in France and Italy, was the first African footballer to win the Ballon d’Or when he was crowned in 1995. He also had brief spells with Chelsea and Manchester City. The former Liberia striker turned to politics after retiring from football and was beaten in a 2005 election, before returning this year as the Congress for Democratic Change (CDC) candidate, going up against Joseph Boakai, who has served as vice president under Ellen Johnson Sirleaf for the past 12 years since Weah’s defeat at the polls. Email “Former World Player of the Year George Weah elected president of Liberia”. Feedback on “Former World Player of the Year George Weah elected president of Liberia”.